The Sounders won 2-1, but Colorado is very much alive in the two-leg aggregate series. Colorado has the advantage Sunday of altitude. Seattle has Nicolas Lodeiro. As a veteran of play in the Andean stadiums of South America, don’t talk to Nicolas Lodeiro about the problems of high altitude at the Sounders’ next game Sunday at Commerce City, CO (elevation 5,164 feet). Of all the virtues his midseason acquisition brought to the Sounders, reflected in the 8-2-4 regular-season record after he arrived, his youthful lung capacity may be paramount in the second of the two-leg MLS Western Conference finals against the Colorado Rapids Sunday. The first leg, played Tuesday before 42,744 at sopping sea level (Clink elevation: four feet), was a victory, 2-1, but with an odious asterisk. The defensive-minded Rapids are 11-0-6 this season at home, and as coach Pabio Mastroeni was eager to point out, they are 14-0 in 1-0 games. A 1-0 win Sunday would win the West and put the Rapids in the MLS Cup, thanks to the road-goal tiebreaker scored in the 13th minute before the Sounders cranked up. The league’s one-time hottest team was admittedly off after the two-week break for international play. It might be the most annoying outside interruption in any postseason since Steve Bartman doomed the Cubs. “I felt there was a little rust there,” said Sounders coach Brian Schmetzer. Fortunately for him, he had some rust-remover in Lodeiro, who in the 60th minute drew a foul and converted the penalty for the 2-1 lead. It hardly made for a decisive rout. Then again, Colorado was the stingiest team in MLS when it came to surrendering goals. So getting a pair was no small feat. Except Mastroeni was OK with it. That it is. 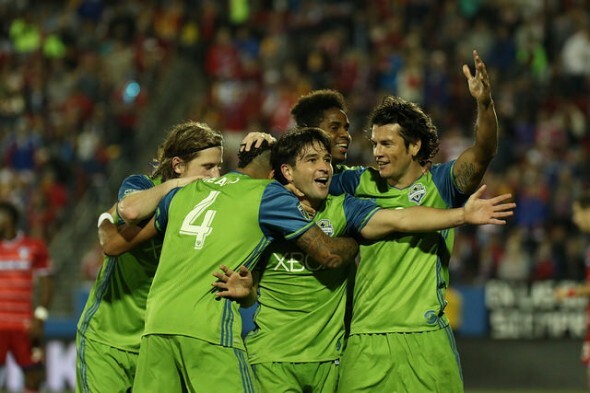 Also relevant is Lodeiro, who is the most influential talent in the series after transforming Seattle’s midfield. The goal was his fourth of the postseason, a Sounders record. As important, he’s making many forget that Seattle is without the two stars that in February figured to be the most active ingredients in another postseason appearance. But Obafemi Martins took an offer for $9 million from China, and Clint Dempsey was sidelined by a heart condition. In stepped Lodeiro, 27, in July, executing a smooth transition that was the opposite of the gear-stripping insertion of another high-profile designated player, Dempsey, in the summer of 2013. “Nico came in prepared,” Schmetzer said. “A lot of times a mid-season DP is coming in after a season and there is a lot of wear and tear on the body. But Lodeiro had a little bit of an injury (and) a lay-off (with Boca Juniors in Argentina). He comes back with Boca, he finishes off a tournament and as he finishes the tournament, he gets in good physical condition. Talent and character were rewarded Monday with the MLS Newcomer of the Year award. Tuesday, craftiness came into play in his goal. He ran down a ball from Jordan Morris in the area, then was clipped by former Sounder Marc Burch and went to ground a bit theatrically. It was Burch’s third foul (one that went unrecorded was the fashion faux pas of wearing a man bun). He knew nothing about the record until afterward. Then again, given the paucity of success by the Sounders in the postseason (zero-for-MLS Cup appearances), it isn’t that big a deal. Progress is certainly the second-half theme. The Sounders barely squeezed into the playoffs with a last-day triumph over Real Salt Lake. Then came a knockout-round win over Houston, followed by a semifinal aggregate win over top-seeded Dallas. Now they are up on the No. 2 seed, Colorado. None of it possible without the fast little guy who leaped into the void. One more goal by Lodiero Sunday at altitude would likely lift the Sounders to heights unknown. Take a deep breath.